This picture from the NASA/ESA Hubble Space Telescope shows the most distant gravitational lens yet discovered. The glow at the centre of this picture is the central regions of a normal galaxy. By chance it is precisely aligned with a much more remote, young star-forming galaxy. The light from the more distant object is bent around the nearer object by its strong graviational pull to form a ring of multiple images. The chance of finding such an exactl alignment is very small, suggesting that there may be more star-forming galaxies in the early Universe than expected. The Hubble Space Telescope as part of the CANDELS and COSMOS survey has captured an extremely rare and very distant dwarf galaxy that is gravitationally lensed. The dwarf galaxy is a record 9.4 billion light years away. 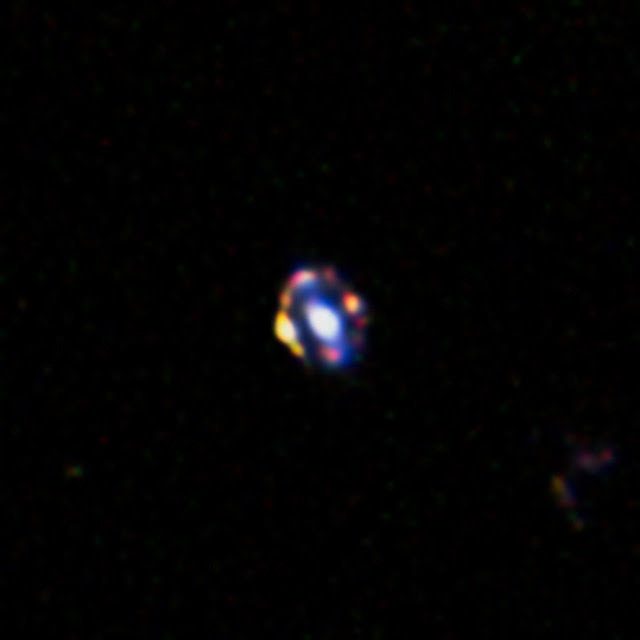 It is a young starburst galaxy that forms a perfect Einstein ring, indicating a gravitational lens with very precise alignment of the lens and the background light source. When two objects (the light source and a lensing mass) is observed, the light from the source is bent and deflected by the gravity of the lensing mass. It allows scientists to measure the mass of the lensing mass as well as the surrounding dark matter (which does not interact with light and only can be detected by gravitational effects). Similar to looking at an object through a wine glass, the light is bent and forms a circle which is called an Einstein ring. The lens also magnifies the background light source, acting as a "natural telescope" that allows astronomers a more detailed look at distant galaxies than is normally possible. In the captured image, the formation of the lens is extremely rare as the alignment has a one millimeter separation at a distance of 20 kilometers - a near perfect alignment. Video: What is Gravitational Lensing? The lensing mass is so distant that the light, after deflection, has travelled 9.4 billion years to reach us. Not only is this a new record, the object also serves an important purpose: the amount of distortion caused by the lensing galaxy allows a direct measurement of its mass. This provides an independent test for astronomers' usual methods of estimating distant galaxy masses — which rely on extrapolation from their nearby cousins. Fortunately for astronomers, their usual methods pass the test. Van der Wel concludes: "This has been a weird and interesting discovery. It was a completely serendipitous find, but it has the potential to start a new chapter in our description of galaxy evolution in the early Universe.